Democratic participation and participation rights have been massively restricted. Their goal is to fight against the (liberal) individual and to struggle instead for the (ethnic) collective: it is not about the individual human being as subject, but instead about the human being as part of a very specific cultural community. In 2012, the “Journal of Democracy" was still talking about "Hungary's Illiberal Turn" – using Hungary’s own chosen propaganda term for talking about the country as an "illiberal democracy". Today, one must attest that Hungary should no longer be understood in terms of a democracy at all. Moreover, the processes of demolishing democracy can only be understood if one realizes that two radical right-wing parties, Fidesz and the party Jobbik Magyarországért Mozgalom (Movement for a Better Hungary), are working in a mode of functional task-sharing. Founded in 1988, the radicalisation of Fidesz can only be understood in the context of its relationship with the party Jobbik, founded in 2003. This is because Fidesz and Jobbik practice a de facto division of labour in Hungarian politics. While Fidesz leads the way in dismantling Hungary's democratic structures in constitutional and legal norms, turning Hungary into a nationalist dictatorship, Jobbik is advancing a racist, anti-Roma and antisemitic struggle against democracy on the street – with assaults and extensive expulsions of the homeless, among other groups. With these two parties, as I have argued elsewhere, Hungary has taken its leave of democracy and has transformed itself into a dictatorship. This is especially the case with Fidesz’ super-majority in parliament, but also the new constitution, changes to the Nationality Law and the Electoral Law, and through a restrictive media law, which allows forms of censorship. The latter is based on general clauses and has demonstrably restricted media freedom. In the official state name, furthermore, the word "republic" was deleted. Hungary’s new constitution is based on an ethnic understanding of the nation, with minorities excluded. Harkening back to Europe’s dark years before the Second World War, family, honour and work are glorified. Myth and God are given constitutional status, while the powers of the judiciary at the constitutional level have been massively limited. These legislative changes comprehensively include explicit ethnic assumptions. All of them have considerably expanded the positions of power of the ruling parties and drastically restricted the rights of the opposition. Both parties are pursuing a rescaling of politics. They base themselves extensively on premodern religious traditions, and then Jobbik, as an explicitly antisemitic party, refers to fascist traditions in speeches, symbols and rituals as well as to pro-Nazi Hungary under its leading collaborator Miklós Horthy. As this suggests, liberal democracy has become the sworn enemy of both Fidesz and Jobbik. An anti-American and anti-European – or at least, anti-EU – attitude, combined with a pro-Russian orientation, also links both parties. Moreover, both act decidedly nationalistically, instrumentalising the so-called “foreign-Hungarians” in places like Romania and Austria, in both law and politics, in order to further their own ambitions for a Greater Hungary; for example as potential supporters in elections. They combine these nationalist principles with an imperial-annexationist claim – in the case of Jobbik, with direct reference to fascist and National Socialist models, and in the case of Fidesz, more closely referencing the traditions of the Catholic Empire of the Magyars, a nationalistically defined ethnic nation within the soon-to-be-revived Magyar Királyság (the “Kingdom of Hungary” in Hungarian). In addition to its autocratic-aristocratic dimension, it has a clearly ethnic connotation – with Magyar culture stretching back more than a thousand years to the 9th century. The differences that can be drawn between Fidesz and Jobbik can be found above all in the strategic occupation of thematic areas: Jobbik often formulates the radical antidemocratic ideas, which Fidesz then implements. 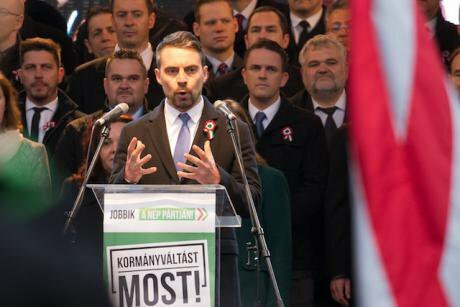 Domestically, Jobbik fulfills the function of a seismograph for Fidesz. They show what room for manouevre there is in Hungarian society for its nationalist de-democratization, and how radically at any stage the nationalist ideals of Hungary can be implemented via street action.